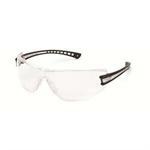 Luminary ® The brightest idea in protective eyewear. Luminary® has the look, fit and feel that make it one of the lightest and brightest solutions in safety eyewear. • Ultra-lightweight design — just four-fifths of an ounce makes it easy to wear. • Patented, two-piece temples feature a rigid upper component which provides stability, as well as a soft, flexible bottom component to provide a superior level of comfort.